We’re REALLY excited! It’s been a long time coming and it’s one of the biggest updates we’ve EVER made. What’s new in EfL 4.0? 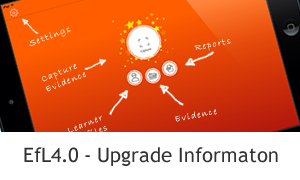 For everyone upgrading from a previous version of Evidence for Learning (EfL), the first thing you’ll notice is the user-interface has changed. We wanted to make the app simpler and more efficient to use … as well as a little prettier. 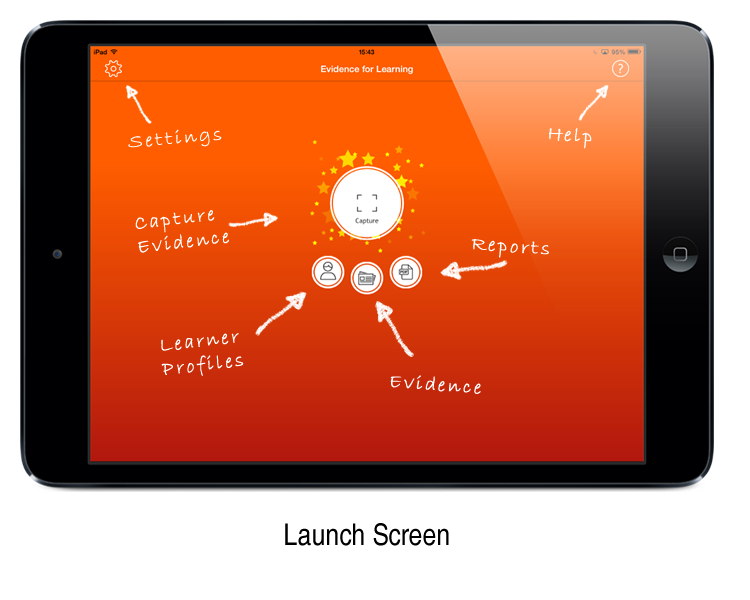 We’ve swapped the old menu system in favour of a new home or “Launch Screen” with 4 easy-to-launch buttons for quickly accessing the capture tools, your learner profiles, evidence you’ve already created and a new report centre, where you can view and make documents and grids in one place. These tools and the old screen layouts have had a makeover too. Dig a little deeper and you’ll see the “Capture Evidence” screen has been improved and transformed into a larger scrollable layout that is much easier to read and work with. ‘Make a Grid’ and ‘Make a Document’ now live side-by-side behind the “Reports” button and the “Learner Profiles” (accessed directly from a button on the Launch Screen) now contain and display the evidence for each of your learners as well as the documents and grids that you’ve created. You may also notice that we’ve added the option of adding ‘date of birth’ for your learners and behind the “Settings” button in the top left of the launch screen you’ll see you can now change the colour of the app – there are 11 to choose from. Another notable and much-requested change, is to how Tags work: when capturing evidence you can specify more than one tag – this wasn’t possible before. Likewise when making a document or filtering evidence, you can specify multiple tags. This will completely change the way tags can be used – your tags don’t have to be mutually exclusive anymore. In addition to the above, if you are using EfL as a Stand-alone Subscription you’ll notice, when capturing or editing evidence, that you can view all three images together and you can reorder the positions of the pictures with a swipe gesture. Try it! As well as all of the above, if you are using EfL as a ‘Cloud Subscription’ you will experience the all-new Synchronisation Engine, which will ensure the System Data on your device is kept up-to-date; that’s the learners, groups, frameworks, tags, date ranges and comment templates. Another really useful feature of the Synchronisation Engine, is that it automatically saves your published evidence to each learner’s Cloud Profile (their ‘centralised’ learner profile in the Cloud) too – provided you are connected to the Internet. What will this mean? The old manual approach of “Sharing Evidence” is a thing of the past! With 4.0, when you save evidence as ‘Published’ (green button) it’ll be saved directly to the learner’s Cloud Profile – instantly visible (and editable) by your colleagues using the same Cloud Subscription. So evidence captured on one device can automatically and immediately be included in learning journeys, profiling documents and grids produced on another device. Finally, in keeping with the focus of this release.. ‘simplicity’.. the Cloud profile is accessed via the Learner Profile button on the launch screen. The Learner Profile has 2 screens: evidence and reports on your device; and evidence and reports in the Cloud. If it’s not on the device, then it will be in the Cloud… and it needs to be in the Cloud in order to be included in a Grid or a Document. IMPORTANT: To enable these exciting new features, each device will need to be ‘paired’ with the Cloud. Think of this as an authentication process, essentially to make the magic work the Cloud needs to ‘know’ all the learners and frameworks etc on the device; so that when evidence is captured, the Cloud knows which Learner/Cloud Profile to store it in, and similarly if a framework is used then the Cloud needs to know which of the frameworks in your Cloud to track. Until your devices have been paired they will not ‘Sync’ to your Cloud. We’ve prepared a few blogs and video tutorials particularly for the Cloud Administrators, those responsible for the Cloud Admin password, to help you through this process. As always we are here to help, please get in touch if you’re unsure of what to do or if you have any queries. Cloud Admins will also see the arrival of the Device Manager. This tool lets you see the ‘last known’ status of all devices on your subscription. At a glance you will see information such as when the device was last seen, whether it’s paired, how much evidence ISN’T saved to the Cloud, the licence code DeviceID used and so on. You can edit your System Data directly in the Cloud. ‘Educator Role‘ is the ‘out-of-the-box’ role used by most users of the app on a day-to-day basis. It lets you add data to your device from your cloud (only) and lets you capture evidence, synchronise to the Cloud and produce reports (as outlined above). Selecting ‘Administrator (Data Entry) Role‘ let’s you add fresh System Data (Learners, groups, frameworks, tags, date ranges and comment templates) to your device and subsequently to the Cloud. Think of it as lifting the bonnet or the hood of your car to carry out maintenance. To help remind you which role is selected, the app turns grey, black and white when you are in the Administrator Role. To add any new learners, tags or frameworks, you’ll need to first select the Administrator Role. Once these (or any other System Data) have been added to the device, they can quickly and easily be saved to the Cloud as Cloud System Data by Pairing the Device. To prevent a device from inadvertently being left in Administrator Role, the core tools ‘capture evidence’, ‘make reports’, ‘make grids’ are disabled when in Administrator Role. As the Learner Profile has been updated to show the evidence for the learner so has the Cloud Profile. When saving a document that has data for more than one learner to the cloud the file is automatically uploaded to each learner’s Cloud Profile and we’ve updated the ‘Email Parents/Carers‘ links and ‘Reset Password‘ buttons to make those features more intuitive. For a long time the focus of many updates has been on new features and tools to help our users do more with Evidence for Learning. The rate of adoption and our user community has grown extremely quickly and with that, we now get lots of feedback and requests for even more new features (which we love receiving – by the way). However, we’ve never really had the opportunity to spend time improving the user interface. Well… earlier this year, the stars were aligned as they say, the timing was right and the resources were in place to overhaul and create a new solid foundation in the app, ready for the next phase of development and to be truly scalable in order to meet the growing demand we are experiencing. In short it’s a BIG change that needed to be done, we hope you will love the changes, we look forward to many more exciting new updates ! It’s a cliche but so true, we’d like to take this opportunity to thank our whole community of users for all the excellent ideas for updates (past, present and future – please, please please keep them coming) but more importantly thank you for your understanding and continued support. Visit our help centre for guidance on what to do next and how to get the most from the new update. Important Information about what's in Evidence for Learning 4.0. A whole new and improved user interface and a number of enhancements and new features to make gathering learning observations, capturing evidence and tracking learning easier, faster and more effective. How do we best meet the needs of our sensory (PMLD) learners?